"A very rich soup to serve on a very cold night! I love this recipe passed to me by my good friend Tasha! I make this one when I have a lot of people to feed. You can let people fix it how they want to, chips or no chips. I like to add sour cream sometimes on top." Heat a large pot over medium-high heat and stir in the ground beef. Cook and stir until the beef is crumbly, evenly browned, and no longer pink. Drain and discard any excess grease. 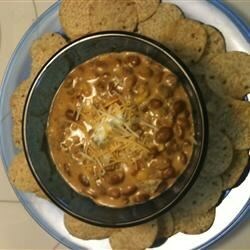 Add the ranch beans, pinto beans, corn, tomatoes with green chiles, processed cheese food, half-and-half cream, heavy cream, taco seasoning, and ranch dressing mix. Bring to a boil, stirring occasionally. Reduce heat to medium-low, and continue to simmer until cheese food is melted, about 20 minutes. This version sounds wonderful! Can't wait to try it! Thanks for posting. Love it! Quick and easy AND very tasty. Thanks for the recipe. Very Good, But very cheesy.